I’m so, so sorry I left you. So enraged was I with the prospect of paying £6 per month for delivery that in a hasty, ill-thought-out move, like a spurned lover I cancelled and left our relationship right there and then. You didn’t even try to tempt me to stay. I can get this cheaper elsewhere! Thought I. And who the hell considers Gnocchi and Smoked Salmon as ‘essentials’ anyway? This is not for the likes of me. I belong with my own kind; in the supermarket with the two-for-one deals on spaghetti hoops. 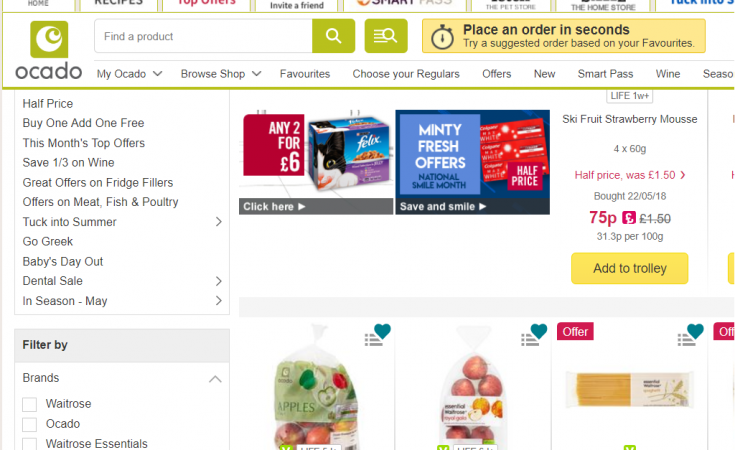 Oh, Ocado… I thought I could handle life without you; but the truth is that I cannot. Since we parted ways, I am a shadow of my former self. It has been barely three months; the cupboards are empty, we’ve run out of loo roll more than once. I had to give the big one sandwiches made with crusts, and got told when she returned from preschool that her teacher said she had the wrong lunch (I don’t know…). I have realised that I took our affair for granted. The others just aren’t the same as you, Ocado. Their webpages aren’t as user friendly. I know your ways, I know how your mind works. I’ve even tried to replace my computer with a real-world experience; I have discovered that I still really bloody hate going to the supermarket, and my kids don’t like it much either. Big shops are harrowing without you holding my hand. Your gentle reminders of things I may want are no longer annoying, but welcome. Not once when I’ve been in the queue at Sainsbury’s has anyone asked me whether I’ve forgotten the Weetabix, which was the only reason I was bloody well in there in the first place. Not once. You, my dear friend Ocado… you know me better than I know myself. You’ve never given me that funny look when all I buy is freezer food and wine. You assume that I do my veg shopping separately, and that’s cool. Maybe I do. OK, I’ll concede we’ve had our moments. Like the time I accidentally bought 7.5kg of grapes, or the time you tricked me into paying a pound for two sodding rice cakes. The sooner you start stocking Pink & Whites, the happier I’ll be. Sometimes you aren’t quite as cheap as the others. But every relationship requires compromise, and I know this now. Nobody is perfect. I had forgotten all the good times we’d shared. Like the time I complained because you forgot my steak, but you didn’t, and I’d actually put it in the cupboard but by the time I realised you’d already given me my money back… I admitted my fault, and you let me keep it anyway. Or the times you threw in a free pie, or a bottle of wine at the end of a shop. I’ve come to realise that I need you. I’ve come crawling back with my tail between my legs, begging for you to take me back. Like an understanding parent you’ve not only accepted me with open arms, forgiving me for changing my card details and forgetting to pay for my last lot of shopping for three weeks, you’ve also remembered my likes and dislikes, and you’ve given me a three month free smart pass. I promise that I will never, ever leave you again. I will forgive your oft-bruised apples. Everdine review: Healthy eating for really busy (or lazy) people - £25 discount code! Hi again Fran, So great to have you back! We missed you! We missed the way you hang your bags for recycling in a jaunty angle off the door. We missed the perky ring of your doorbell and the way you casually fold your receipt! It's the little things that pluck the heart strings! We spoke briefly earlier in the week, and your blog has created waves for all the right reasons here at Ocado GCHQ! Still as topical now as last year. I really prefer to do my shopping in person and most of the time I am able to do so, so I only buy groceries online when I’m poorly or rushed off my feet. I’ve tried other supermarket delivery services and been disappointed every time, so I always come back to Ocado. It might work out a bit more expensive, unless you juggle offers very carefully, but it’s worth the extra. And the bonus is that I can sometimes pick up the treats that I normally only get on trips to France.